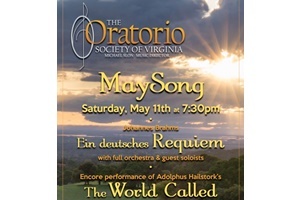 The Oratorio Society of Virginia presents one of the seminal pieces in choral masterworks-- Johannes Brahms' Ein deutsches Requiem. A true choral blockbuster, this is Brahms' longest composition and is a large-scale work for chorus, full orchestra, and soloists. During this concert, Oratorio will also have the pleasure of sharing an encore performance of The World Called, an original commissioned work composed by Adolphus Hailstork for the Oratorio Society’s 50th Anniversary. With full orchestra and featuring guest soloists Christina Pier (soprano) and Trevor Scheunemann (baritone). For more information, please visit www.oratoriosociety.org.